I am new on this Blog, thanks Sue! My name is Maria del Valle and I live in Spain and love the Blackbird designs, like you. 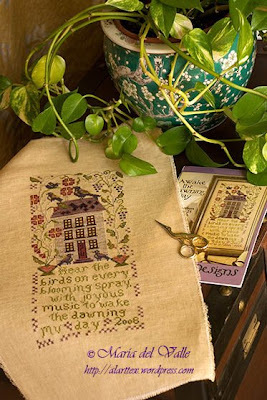 This is my first embroidery about BBD "Awake the Dawning Day" from a kit. Yesterday I started the second and I am enjoying!, I hope you like it. Also you are welcome to my blog Allartex! Very nice work! Welcome to the BBD blog! I love the patterns. I haven't seen it before. Thank you for sharing! I like your blog. Beautiful finish Maria. Que precioso.